DJzone DJ Magazine :: New Lighting! Keep your basic plug n' play fixtures in check with this multi-tasking CHAUVET controller. 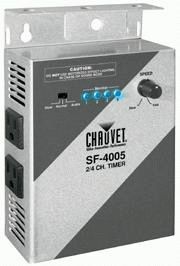 The SF-4005 is a 2 or 4-channel timer/chaser designed to keep your lighting effects from exceeding their recommended duty cycle. 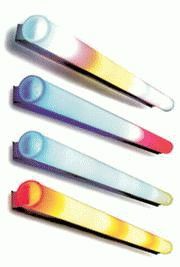 Chase or sound-activated modes are also ideal for pin spots, par cans and any other chasable lights. A three-position switch controls timer, chase and sound-activation functions. Another switch lets you select two or four channels for timed control of up to four lighting effects.